SEATTLE — The U.S. Coast Guard, U.S. Marine Corps, U.S. Coast Guard retirees, along with residents from the city of Cle Elum, Wash., honored Signalman 1st Class Douglas Albert Munro, the only Coast Guardsman to receive the Medal of Honor, at an annual ceremony at Laurel Hill Memorial Park in Cle Elum, Friday. 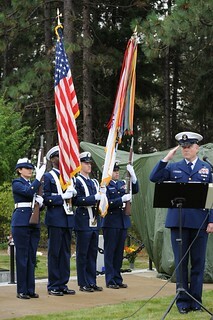 Members of Coast Guard Base Seattle Color Guard present colors during a ceremony to honor Signalman 1st Class Douglas A. Munro Sept. 27, 2013. Coast Guard photo by Petty Officer 3rd Class Katelyn Tyson. Munro, a native to Cle Elum, led a small boat force during the battle of Guadalcanal on September 27, 1942. Munro was fatally wounded while extracting a battalion of nearly 500 Marines who were under attack by Japanese forces. For his heroic and selfless actions, Munro was posthumously awarded the Medal of Honor and the Purple Heart Medal. The ceremony also featured the unveiling of two newly refurbished cannons that stand at Munro’s gravesite as a permanent memorial and reminder of his devotion to duty and his country.